The villa fulfils every requirement for the perfect holiday any time of year! Its spacious , modern, well built, it has large garden, fully enclosed, 10m pool with the option of pool heating for those colder months. The villa has under floor heating so really can be let 12 months a year.The location is perfect within an easy walk to Coral Bay centre with bars and restaurants, no car needed unless you want to explore. En suite 1 and 2 upstairs both with showers, wc, washbasin downstairs bathroom with bath, shower over and wc. Large brand new kitchen, granite work tops, fridge freezer, electric oven, hob and extract. washing machine, dishwasher, toaster, kettle, microwave, well equipped with crockery and cutlery.Patio doors to outside dining and back door to barbecue. larger first floor balcony leading from the master bedroom offering beautiful sun sets. outside dining is covered offering shade,with glass topped table and 6 chairs. large terrace area around the pool with sun loungers and parasols. Property is lovely, well equipped with decent quality furniture, particularly bed mattresses. Villa is lovely, pay the extra to have the pool heated, it's worth it! We are so glad you had a lovely stay with us and liked the villas standards, especially the mattresses! and yes at the time of year you stayed its a god send having a heated pool.! 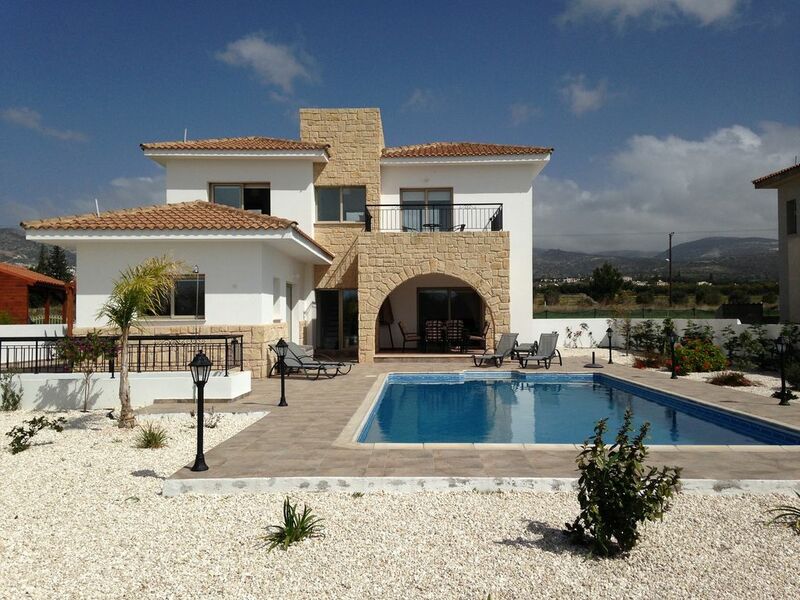 Lovely villa with enough space for 6 adults. Each couple had their own bedroom and bathroom and good space in lounge and kitchen. Everything we needed, well equipped and comfortable. The villa is well placed , short walk to the supermarket and only a little further to walk into the Main Street of Coral bay to restaurants and shops. The pool was the highlight of the week, we are glad we paid extra to heat it as the weather was not always as warm as we'd hoped but but we were able to use the pool each day. Garden area very attractive too. We had a fabulous family holiday and would definitely recommend staying here. so sorry you didnt get the normal glorious weather we have, this has been the worst winter since 1906 but glad its not spoilt your holiday in any way! Absolutely loved my week in the villa-second time stayed here and it was just fantastic. Also third time we have stayed in a villa by Felix and Lisa. The villa has all you need and is close to the beach and the bars and restaurants. The pool and garden are outstanding. Lisa and Felix are extremely helpful and welcoming- food made by Lisa on our welcome was lovely. Also when had trouble with our transfer Felix was a great help. Highly recommend this villa and hope to come back soon. It’s lively for potential guests to realize people like the villa so much they return ! We had a wonderful holiday. The villa and pool were furnished and maintained to a very high standard. The owners were really lovely and gave us lots of information about great places to visit locally. We would definitely stay again. We’ve just returned from 2 weeks in this lovely villa and everything was fabulous! The villa is bigger than it looks on the photos and perfect in terms of location, comfort and facilities. As we were arriving late we ordered a meal from Lisa which was delicious and very welcome! The ‘strip’ and the beach were a 12 minute (slow in the heat) gentle stroll and we took a taxi one evening to the Sea You beach bar to watch the sunset which was lovely. There’s nothing not to like - highly recommended! Glad you enjoyed your meal. and loved all the villa had to offer. a taxi ( or bus) to sea you bar on the road heading into coral bay is a must, to have a sundowner and watching the sun set is the perfect way to end a day. many thanks for how well you looked after the villa. Due to its location it is ideal for those wanting to have a water sports holiday, there are many diving schools locally with everything from beginners courses to some superb wreck diving for the experienced diver. Georges Ranch for those who like horse riding is a 5 minute drive. Due to the climate it is popular for both walking and cycling holidays plus the benefit of the four golf courses meaning there is something for everyone. Coral Bay is one of the best beaches on the island, it is blue flag and sandy and commands a beautiful bay with usual flat calm seas. It can also provide a limited amount of surfing when the wind blows in the early part of the year. There are Buoys to mark the swimmers area as the beach does have sporting activities such as sailing, peddle boats, and fun rides etc. There is a cafe on the beach and a changing facilities with showers. Sunbeds and umbrellas can be hired. Nearest airport is Paphos which is a 30 minute drive. Larnaca is 1 hour 30mins. The bus stop is 5 minutes down the road and runs every 10 minutes in the summer, 20 minutes in winter late into the night into Paphos and onto the Water Park. A taxi from the airport is approx 45 Euros which can be arranged as can a very reliable car hire company. All the below distances are genuine, we have walked them dragging our two kids along! Restaurants and bars of central Coral Bay 10 minute walk Coral Beach Hotel 15 minute walk. Coral bay beach 10 min walk, Paphos Zoo 10 minute drive. Paphos town, Harbour am Water Park 20 minute drive, Polis and Latchi 30 minute drive.